Oasis Africa comes to the island…. 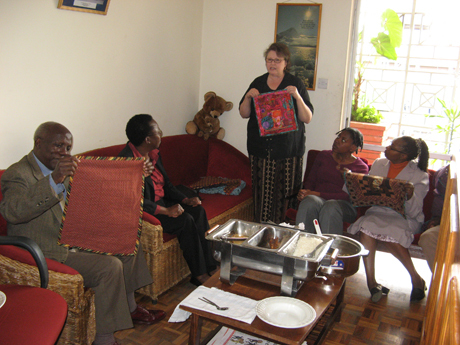 From Jill: "Mom sharing her plans with the Oasis Africa staff before we set out to Mashaka. Gladys is on the sofa and Gershon is admiring one of Mom's quilts." Drs. Gladys and Gershon Mwiti of Nairobi, Kenya will be speaking at the Mullis Center Wednesday, March 31 at 7:00 PM. They will be discussing the current state of the Mashaka Quilting Project which was started last year by Kitty Sorgen and Jill Urbach with lots of local support. The Mwitis will also discuss future plans for Mashaka. Drs. Gladys and Gershon Mwiti are the founders of Oasis Africa, a nonprofit organization with a purpose and commitment to bring healing to many hurting communities in our world, and to build leadership committed to integrity and accountability. Dr. Gladys Mwiti is an internationally-acclaimed speaker. Dr. Gershon Mwiti is a Leadership Consultant and CEO, Leadership Institute of Kenya (LIKA) who has recently been brought in to work with the Kenyan Parliament.